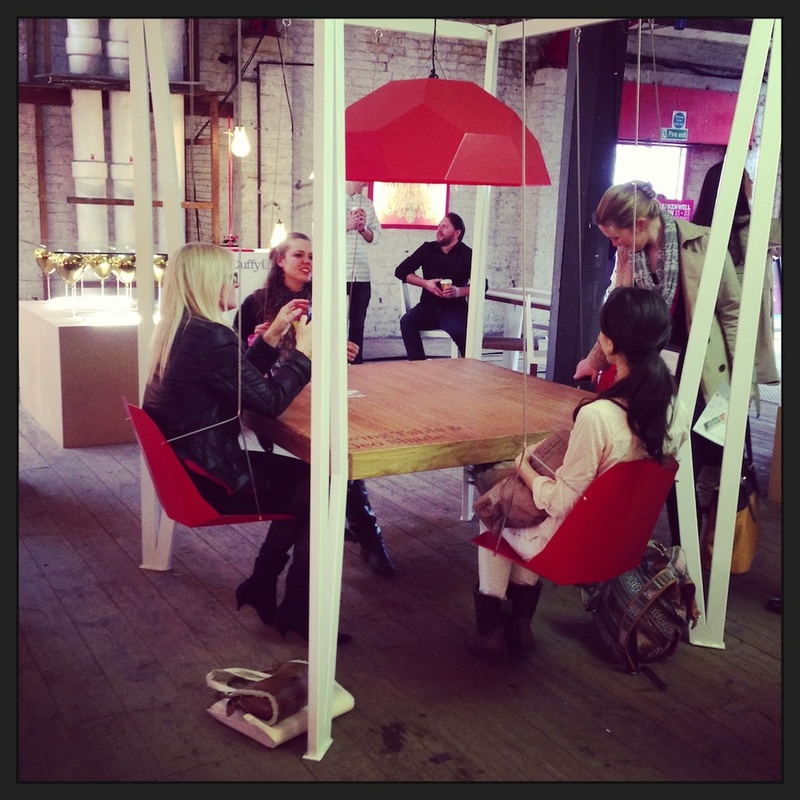 Clerkenwell Design Week took over the EC1 area of London for three days last week. Now in its fourth year it is gaining in popularity and becoming a not-to-be-missed event in the design calendar. It's also free, and open to anyone, you can just register on the day. The pink signs dotted about the place signify where, when and what is going on (see above). Centred around the Victorian-era Farmiloe Building on St John Street, which is a temporary home for new products in contemporary design, the show works in partnership with local design showrooms (of which there are many in this area) and is hosted in two other excellent historical venues: the spooky House of Detention and the ecclesiastical Order of St John. Here are a few of the things I saw. The Swing Bench by Duffy London looks like the kind of thing you might find in Google's HQ. And guess what? The designer (in the background, seated, holding a coffee) has already sold one to the Swiss office. 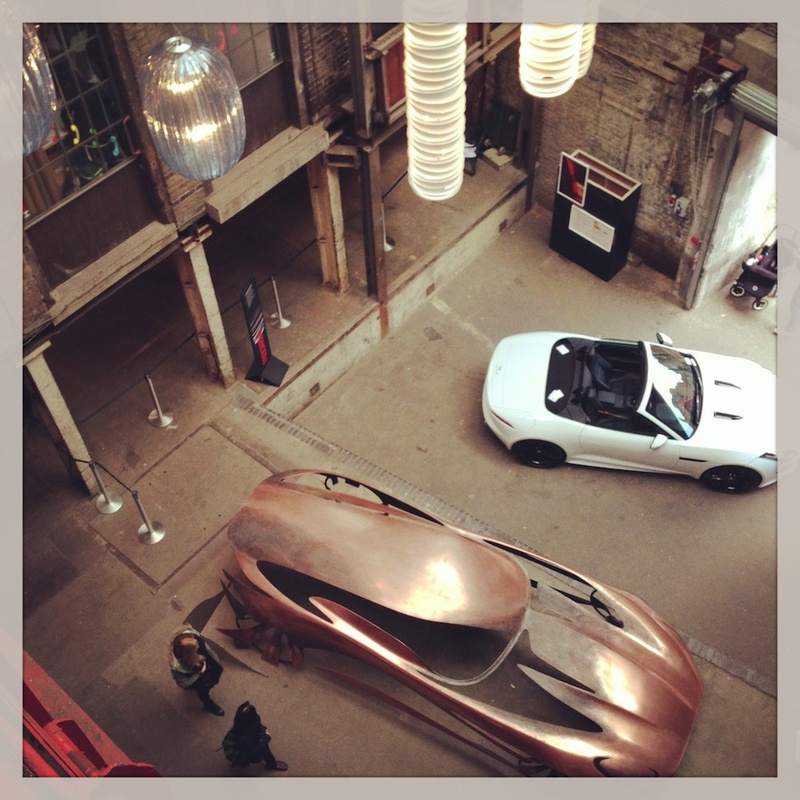 Looking down onto a striking bronze sculpture of a Jaguar (who sponsor the event) inside the Farmiloe Building on St John Street, where most of the action takes place. Emerging designers were located in the moody subterranean confines of the House of Detention which was once a Victorian prison. Behind the bars you can just make out pieces by Latvian company Sampling. There was a lot of buzz around Donna Bates's Parlour Lighting. These looked fantastic up close - the angular, cork-covered Tetrasheds which won an Elle Decoration Award last year and have been sold for use as home offices, bars, an extra room and even a pool house.